Melatine®, hydrolyzed keratin rich in melanin, is a innovative ingredient which is the result of a long scientific research whose first objective was to Stimulates melanogenesis and restores natural hair color. 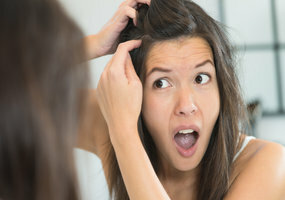 When hair follicles are not getting enough nutrients and minerals (or are influenced by other factors), they stop producing melanin – the pigment responsible of the hair color. As a result, hair turns progressively gray. Promotes healthy hair, reduces hair loss and strengthens hair by stimulating the activity and regeneration of keratinocytes. Has strong antioxidant activity which protects and fights against free radicals.